The BlogHer Conference is taking place in Chicago on July 27-29th. There will also be a conference in Second Life. 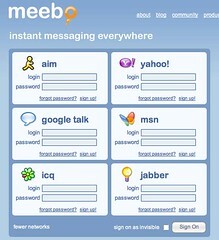 Meebo is a cool online application that allows you to log onto instant messaging without an instant messaging client on your computer. Meebo currently supports AOL, Yahoo, Google Talk, ICQ, and Jabber. I'm an instant messaging junkie. Mostly I use the IM in Skype but I can also be seen on the AOL IM platform through iChat. I know lots of folks that also use GoogleTalk, Yahoo's IM offering, and so forth. This means, in general, these folks will have many different IM clients open. Adium (sound like a new cholesterol drug) allows you to access many services in a single client rather than having multiple windows open. Due to significant downtime on NPSL's old host provider, the Management team made the decision to move NPSL to Brownrice Internet, a hoster that I am very familiar with. Brownrice has agreed to host NPSL for free. If you want to let them know that you appreciate the donation, let me know and I'll pass your comments onto the President of the company. Please let me know if you see any strangeness on the site. Migrations rarely go perfectly (check out this COMMENT for an example) so help me out and send me a note if you see something broken. I was asked by a good friend if I could merge the NPSL Offside Links and the Deli.cio.us NPSL links feeds into a single feed on nonprofitcommons.com in a block on the left side of the site. I took care of it this evening, and it is actually a piece of cake to do. These steps work in Drupal 5.x. find a Drupal module and install the dang thing Creech! use my idea. Read about it in the comments. Dutch NGO opens "Good Causes Island"
Yesterday saw the opening of a Dutch NGO island, called "Goede Doelen eiland" (good causes island). The island is a presentation of the Dutch Red Cross and the Dutch Fund for Disability Sports. The island is sponsored by Dutch bankers ABN Amro and the Free University of Amsterdam (VUA) and was build by students of the VUA. Videos, Podcasts, and Post-Event Analysis at MacArthur Foundation Blog Available! On June 22, MacArthur Foundation President Jonathan Fanton and Linden Lab CEO Philip Rosedale (a.k.a. Philip Linden) had an historic conversation about how virtual worlds could revolutionize philanthropy. At the event, Fanton also announced that the foundation would begin a year-long investigation into virtual worlds, including making some in-world grants through the USC Annenberg Center on Public Diplomacy. The MacArthur Foundation blog has recently posted the complete event documentation, including pointers to articles and blog posts, podcasts, and videos.